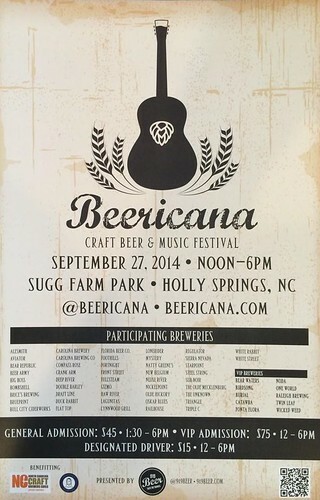 If you like craft beer & food trucks you wouln’t want to miss Beericana this weekend in Holly Springs. This Craft Beer & Music Festival will feature over 60 Breweries from across the state and beyond. There will also be 10 food trucks onsite and live Americana music all day. This event will take place outside at Sugg Farm Park and the weather forecast is looking beautiful with sunny skies and temps in the mid 70’s. 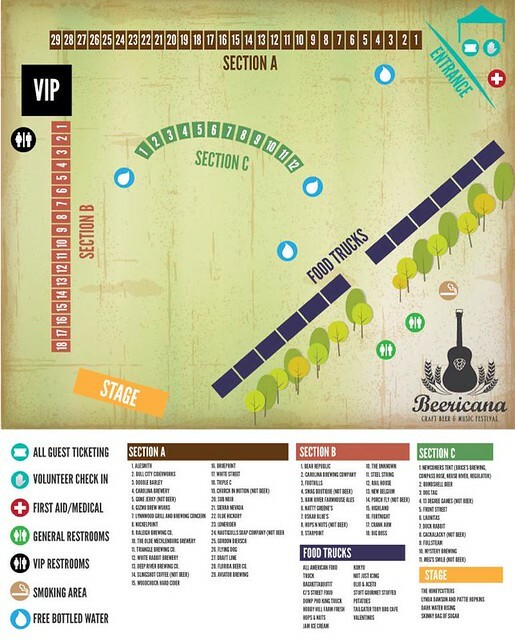 The layout of the festival is provided in the map below. Tickets are $45 for general admission, $75 for VIP, and $15 Designated Driver. Tickets can be purchased online at Beericana.com. You can view the full list of breweries here. There will be plenty of great local trucks too, view the list of food trucks here. Parking is Free. For updates & inside notes follow them on twitter @beericana and @919beer. All attendees are urged to taste responsibly. Please know your limits. No one under the age of 21 will be admitted into the show. Valid photo identification must be presented. Check out the FAQ on the the event website for additional details.